Time seems to have escaped us and it’s been a while since the last blog post, so a little catch up is needed. Since May we have seen our Artists in Residence depart to their distant homes, Michael Bullen, our Studio Technical Manager and talented artist has delivered a very successful Skills Class: Glass Painting Techniques and we are currently coming to the end of a nine-day International Student Symposium; ‘Highland Inspiration – Location and Self’ with Michael Rogers and Jane Bruce. Students have come from The Alberta College of Art + Design, Calgary, the Rochester Institute of Technology, Rochester, NY, and the Montana State University School of Architecture, Bozeman. 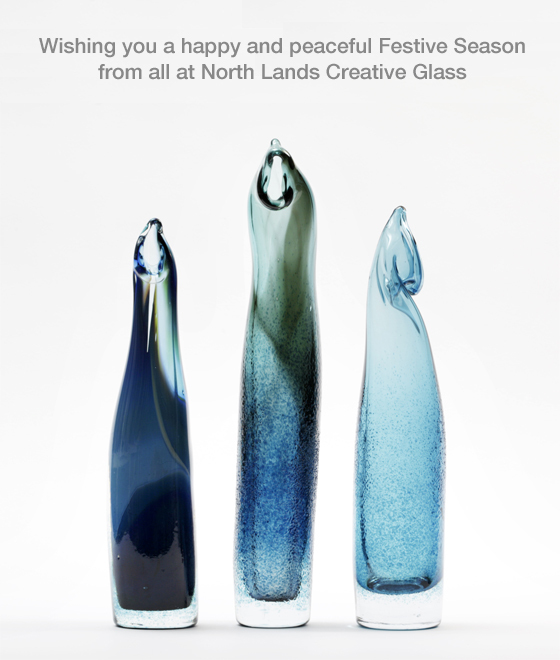 North Lands Creative Glass and Edinburgh Sculpture Workshop are working in partnership to offer a nine-week residency for four visual artists. We are looking for two sculptors and two glass artists who have an interest in exploring new forms of making through collaboration. A high level of experience in hot casting processes either in metal or glass is preferable. We were delighted to welcome Carrie Fertig to North Lands to lead a Glass Skills Class in Sculptural Flameworking. Also known as lampworking , flameworking is the manipulation of glass rods and tubes. The heat from the flame of a gas torch enables one to add and subtract solid glass, and blow hollow glass, all with minute detail. Hand torch use was also taught to enable the building of large-scale sculpture. The class ran over five days with intensive tuition focusing on techniques but in the context of more conceptual approaches. Our glass Master Classes for 2012 will be running between 29 August to 19 September, and instructors include Angela Jarman, Jacqui Poncelet, Paul Marioni and Susan Stinsmuehlen-Amend. Take a look at our blog post from the 2011 Conference and our Master Class Flickr images – every picture tells a story!